are short because we have so much to learn, but inevitably they happen. There is something so timeless about women chatting and doing handwork together. 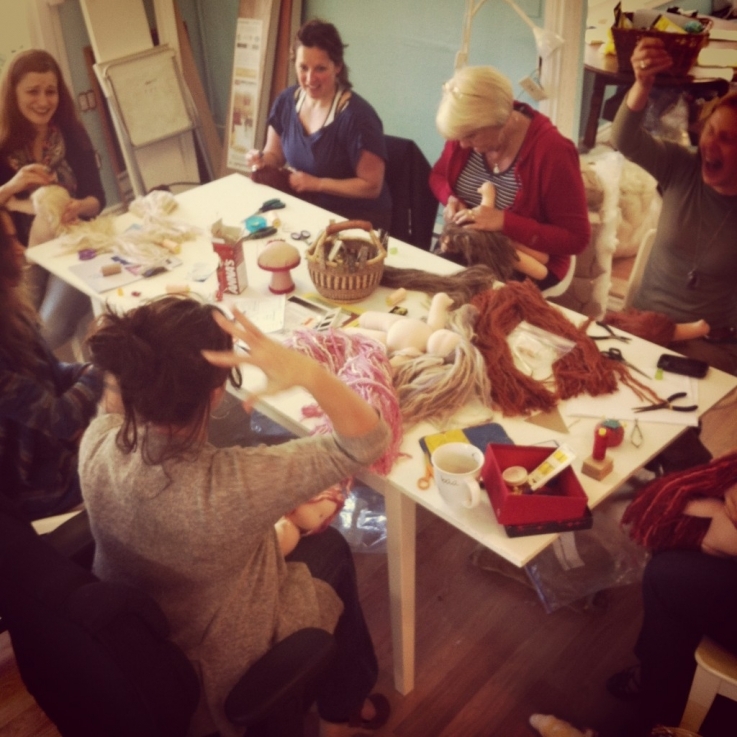 One of my lines that I use during the training session is, ‘Christina is an artist and we are being asked to help create her art, so consider yourself an artist.’ I get such a warm feeling witnessing a new sewer learn, struggle, complete their first doll and bring it in as a completed work of art. Making a first doll is a moment that will not be forgotten. I always feel so honored and blessed to train new sewers. Renea, not a silly question because I was thinking the exact same thing! Yes! They do get to keep their first doll 🙂 Then the subsequent dolls get done, seam ripped apart then re done. Then after that ‘phase’ we have the ladies make dolls out of our booboo parts – marks on them, or old ‘skin’ – we have LOTS of these bits that don’t make the ‘cut’. Then the ladies start making dolls that we keep here (we have over 200 now since January alone!). This phase varies with each sewer – we have some that make incredible dolls after only 10 or so then we have ladies that take quite a bit longer. It’s slow going in the beginning and it usually takes about 6 months before a SM is producing dolls to our standards. Even then each doll goes through Rachel and Sarah who spend two entire days going through every doll and check everything to make sure that it’s built to last! (we have a 74 point checklist they go through with every doll that we keep here) I am so lucky to have Shauna teach. Her doll making skills are amazing and she is a natural teacher (she actually teaches Five Rhythms here in the Cowichan Valley!). It’s so amazing to see how many people are a part of how this all works flows and it seems that the most perfect people come along at exactly the right times! Please come and train me in South Africa??? Pretty please?! You can combine it with a lovely holiday in our beautyful country. 🙂 I would love to learn your skills and quality of work. Imagine having a Bambo sister-workshop in SA!